Your First Real Estate Investment: Why Not a Condo? If you’re thinking about investing in real estate, have you considered a condo? A lot of people overlook this option, but a condominium is a great way to get into real estate investing. Because condos are usually smaller and simpler, there is less that can go wrong with them. Also, if you choose a condo with a healthy reserve fund (and you should), there will already be money set aside to pay for repairs and maintenance issues that may crop up while you own your rental unit. If you choose carefully, investing in real estate with a condo has a few key advantages. Let’s take a look. When you pay monthly condo fees, you’re actually buying insurance, which provides a form of protection for your investment. If anything goes wrong, there should be a large reserve fund ready to help you remedy the problem. 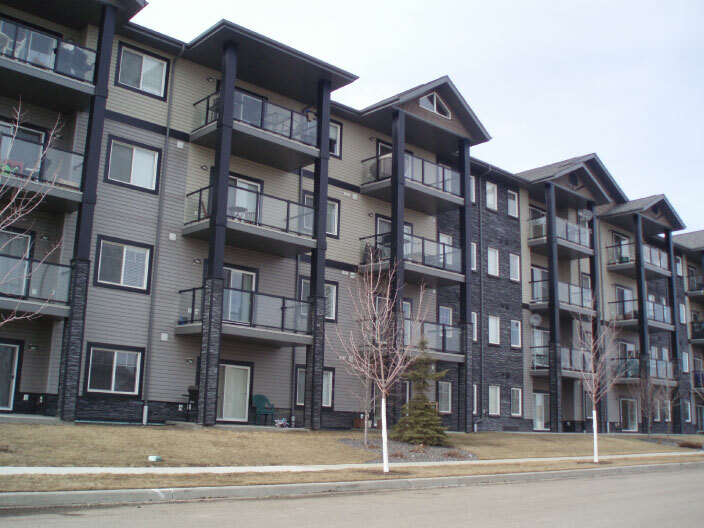 Most importantly, a large amount of the critical maintenance in a condo is exterior maintenance. If you own a condo as a rental property, you shouldn’t have to worry about the roof, the siding, trim, windows, doors any common areas or even the foundation. Another benefit is that your condo fees will ensure that the grass is cut and leaves are raked – without having to nag a tenant to do it or do it yourself. There have been a few cases of structural defects in condos in the news in the last little while, one in Fort McMurray and one in Leduc. This has many people running scared from condos, but bear in mind that these are rare occurrences that could just as easily happen to a house. If you suspect any structural work is needed or if the condo documents of a property you are considering are at all vague, be sure to call in a professional inspector to make sure everything is sound. Don’t ever rush into a real estate purchase, and remember that if something seems too good to be true, it probably is. Interior maintenance is still your responsibility when it comes to a condominium, but that maintenance is usually minimal. If you choose to repair flooring or walls or to repaint, you can usually defer the work for a while because it won’t be crucial. Most of the big stuff (like the roof, windows and structural integrity) is already taken care of – or should be – if the need arises. Whereas you aren’t likely to be living next to your renters if you own a detached property, a condo (townhouse or apartment) may provide some spies to help you keep an eye on your tenants and ensure they are behaving themselves. Loud noises, big messes and midnight moves are likely to be noticed by the neighbours – especially in a condo, where many neighbors will be owners with a stake in the property. By letting your neighbors know that you have a vested interest in being a good owner and ensuring your tenants abide by the rules, you can build some important allies in the building. This can be a great way to stay informed and avoid tenant disasters. Even though a condo may be an easier investment in many areas, there are some things to consider. First, owning a condo doesn’t mean you can expect to do nothing but collect rent cheques. You should probably be involved with running your unit, as well the building in general, at some level. Maybe this means being on the condo board or talking to a board member or property manager to keep up on recent events. Keep an eye on the way your complex or building is being run so you won’t be blindsided by any changes, charges or issues. Plus, it’s important to remember that not all condos are good investments, so choose carefully, just as you would with any real estate purchase. Some things to consider are the owner/renter mix, the condition of the building, the involvement of the board and the reserve fund. Try to pick a building you would like to live in yourself. That should keep you focused on the things that are important. Long-term security is the name of the game in real estate investment. When it comes down to it, there is no perfect investment. And if the market is rising, and you’re still saving to buy a house for your investment, you’re just missing out on that growth. If this is your first shot at investing in real estate, a simple condo with an involved condo board and professional property management should provide a fair bit of insurance, reduce stress and help contribute to a successful investment.